Who decides how land and water is used and distributed? Who benefits and who loses out? And what are the consequences for the environment? These are some of the key questions that Both ENDS has asked in different contexts and countries across the globe. And they are precisely the questions the Netherlands Environmental Assessment Agency (known as PBL) wanted to ask in relation to large-scale agricultural development and natural resource management projects in Sub-Sahara Africa. PBL is the Netherlands’ institute for strategic policy analysis in the fields of the environment, nature, and spatial planning. It conducts research and collaborates with key European and international bodies, such as the environmental directorate of the Organisation for Economic Co-operation and Development (OECD) and the United Nations Environment Programme (UNEP). To find the answers it was seeking in Africa, PBL deferred to the expertise of Both ENDS and its partners. As part of a programme on sustainable African food production systems, PBL commissioned Both ENDS to analyse the strategies of local and national governments, international and local companies, local populations and their representatives and civil society organisations in Sub Sahara Africa in distributing and trading land and water. 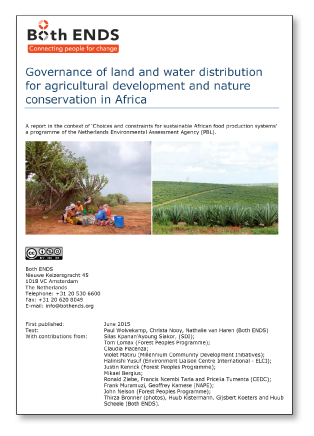 The result, published in 2015, is Governance of land and water distribution for agricultural development and nature conservation in Africa, written by Both ENDS based on of 9 case studies complied by scientists and (local) experts working in the region. The report describes the dilemmas faced by the respective governments to achieve economic development while simultaneously addressing acute problems of extreme poverty and undernourishment suffered by large segments of the population. The report also tells the story of ambitious foreign funded agricultural development and conservation projects situated in fragile ecosystems among traditional rural societies. It describes strong national and international policies – on paper -, and the failure to implement these in practice, allowing companies and implementing agencies to often operate with little or no consideration for social and environmental regulations and safeguard policies. Nearly all cases involve massive expulsion of rural people to make room for large-scale, top-down projects. Based on a analysis of these cases the report concludes that by and large small farmers and forest dwelling communities – responsible for 90% of food production in Africa – hardly benefit from such projects. The report points at the need for government, companies, and financiers to comply with mandatory and voluntary regulatory frameworks, key among them the principle of FPIC (Free Prior Informed Consent) and the Voluntary Guidelines for the Responsible Governance of Tenure of Land, Fisheries and Forest in the Context of National Food Security. The report also signals the many opportunities which exist to steer investments, funding and support towards local farmers and other entrepreneurs in recognition of the key role they play or could play in generating food security, ecosystem management and restoration and creation of employment opportunities. Both ENDS discussed this and other important conclusions from the report in a presentation to PBL staff.